From the federal Renewable Fuel Standard to state-level Renewable Portfolio Standards, mandating energy sources is destructive. A recent effort in the Oklahoma legislature, which would have required three-quarters of the state’s electricity to be generated from natural gas by 2020, demonstrates that the danger of these mandates is not limited to just wind and solar. While the bill was recently defeated, it is instructive nonetheless. Giving special treatment to specific energy resources—whether they are renewables or conventional fuels—is detrimental to American families. Time and again we’ve seen energy mandates hurt Americans by driving prices higher. Several state Renewable Portfolio Standards (RPS) that require states to generate electricity from expensive, unreliable energy sources like wind and solar are prime examples. As one Manhattan Institute study explains, “RPS mandates make electricity more expensive. When retail consumers subsidize electricity supplies at above-market costs, retail prices inevitably rise, even if the fuel is ‘free.’” By contrast, free markets are better at keeping prices affordable, preserving the environment, and creating opportunities for all Americans. This principle extends beyond mandates for renewable sources. Electricity from new resources—even generally affordable natural gas plants—is more expensive than electricity from existing resources. A 2015 Institute for Energy Research (IER) study found that existing coal plants produce power at about one-third the cost of new wind facilities. Furthermore, electricity from existing coal is also almost half as costly as electricity from new natural gas plants, even though natural gas is the least expensive of new resources. 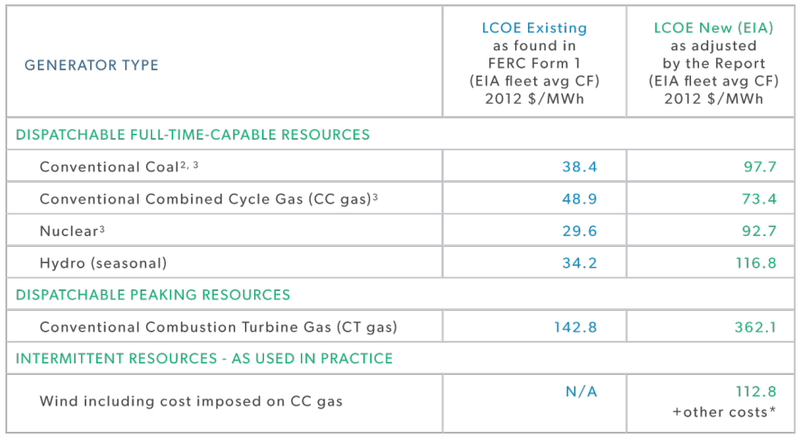 Overall, competition allows the most effective energy sources to benefit consumers. A distinct but related problem is the lack of fuel diversity these mandates can cause. For example, Oklahoma’s proposed natural gas mandate would have required that 75 percent of electricity come from natural gas. However, as recently as November 2015, the U.S. Energy Information Administration reported that Oklahoma generated over 50 percent of its electricity from sources besides natural gas. In other words, Oklahoma’s energy supply would have to become less balanced to meet the standard. Experts from IHS Energy evaluated the impacts of reducing fuel diversity by increasing natural gas generation to three-quarters and found that the costs would be significant. Specifically, the cost of generating electricity would be “more than $93 billion higher per year and the potential variability of monthly power bills was 50 percent higher compared to the base case.” Allowing Oklahoma ratepayers to determine which sources are most appropriate for their state makes the electric grid more valuable for everyone. Fuel diversity also recognizes the uniquely beneficial roles that certain energy sources play on the grid. For instance, nuclear and coal plants are generally best for generating base load power, while different types of natural gas plants are usually better for intermediate or peak load purposes. As another IER analysis concluded, even if the costs are sometimes hidden, prematurely closing existing power plants upset this beneficial relationship. Despite the clear problems with energy mandates, government policies continue to pick winners and losers and prioritize politically favored sources. Even for natural gas, which plays an important role, government favoritism is problematic and should be rejected. Oklahomans can be thankful that their representatives recognized this danger and stopped the RPS mandate in its tracks. Jonathan A. Lesser, Less Carbon, Higher Prices: How California’s Climate Policies Affect Lower-Income Residents, The Manhattan Institute, CEPE Report No. 17, July 2015, p. 2, http://www.manhattan-institute.org/pdf/eper_17.pdf.